The assembly of the species lists (Vol. 1. 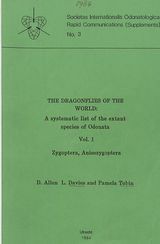 Zygoptera, Anisozygoptera; Vol. 2. Anisoptera) is a consequence of the encouraging reception of our Generic Synopsis of 1981. From advice and opinions we have received from many friends a new edition of the Synopsis has been completed and will appear shortly; it has provided a modified suprageneric structure for the species lists. The definitions are cursory, indeed many are inadequate, especially among subfamilies, but an improved taxonomic framework requires much more study and is, to our knowledge, even now being attended to. This should be regarded as a starting list. We hope it will be useful as a basis for adding the kinds of data needed for ecological and conservation studies as well as for taxonomists to build upon and improve. The synonymy included is aimed only to cover names encountered in fairly recent literature We have omitted, with a degree of arbitrariness, many early names, mainly for some of the common European and N. American species where descriptions were brief and true identity is in doubt. Much synonymy certainly persists and we hope the lists will help to focus attention on genera in need of revision.